The Atlantic Salmon is one of the largest fish to be found in the Ribble Catchment. It weighs from 3lbs up to around 40lbs. The salmon enter the river at various times of the year “running” up our rivers to the small becks and streams to lay their eggs (spawn). In the winter they will gather in pairs in areas of good clean water and gravel and the female fish will dig a hollow, or redd, in the gravel using here tail, she will then lay here eggs in here, and alongside the male will shed his milt to fertilise the eggs. These eggs then hatch as alevins in the spring and remain in the gravel until they have absorbed their yolk sack. At this point they leave the cover of gravel and start to feed in open water and are known as fry. The fry become parr once they have spent their first winter in the river. After a second winter and up to 4 winters the parr then migrate to the ocean in the following spring. They then feed heavily on the rich food in the ocean (sometimes as far away as Canada), and after one winter some will return as Grilse, some remain for another winter and up to 4 winters in the ocean before returning as Salmon to start the cycle again. 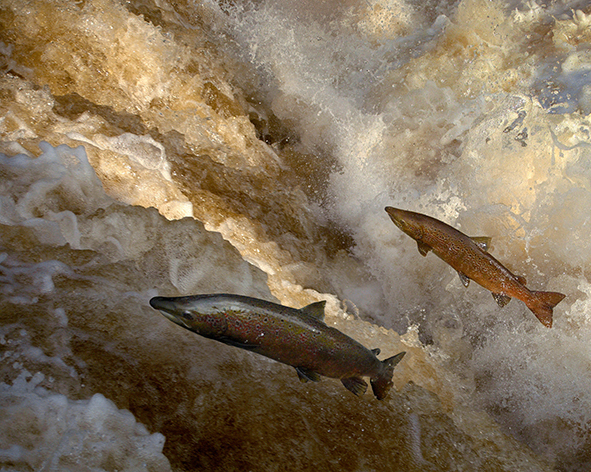 The salmon almost always return to the stream where they hatched as an alevin. Salmon can be seen leaping water falls and weirs and sometimes they will leap out of the water in a pool for no obvious reason! After spawning in the winter the salmon are called kelts, and around 80% of kelts die. The carcasses of the kelts provide important food for invertebrates (and other animals along the river banks) which in turn provide food for the salmon fry. The sea trout are very similar to the salmon, and you often have to look closely to tell the difference. However the Sea trout can be much smaller some even ½ lb in weight. They can grow up to 21lbs but this is very rare. In much the same way the sea trout lay their eggs in gravel, but generally smaller gravel than the salmon, and also in smaller becks. The eggs hatch, becoming alevins and parr the same as salmon, and head to the sea in the spring, some sea trout will return before the first winter, where as others will remain in the ocean for longer periods. The sea trout don’t travel as far in the ocean as salmon sometimes remaining within a few miles of the estuary of the river of their origin. Sea trout tend to run the rivers at night and are more elusive than the salmon in the day. However at night you can see them trying to wriggle through very shallow water often with their backs out of the water. Much fewer sea trout die after spawning and it is not uncommon for sea trout to spawn several times. to make it easier for elvers to negotiate the weir. 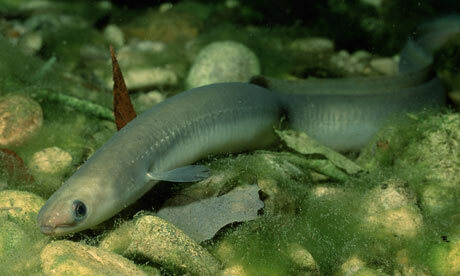 The eel is a long slender snake like fish. It has two pectoral fins and a joined dorsal and tail fin. It has a dark grey blue upper body and a lighter grey white under belly. It feeds mainly on other fish, hunting at night. It also has a migratory journey as part of it’s reproductive cycle. However it is almost in reverse to the salmon. The juvenile eels or elver enter our rivers and streams and travel upstream, sometimes over land and out of water (Eels are capable of breathing through their skin and as such can withstand low oxygen conditions), In Freshwater they grow quickly and often can reach 90cm in length. They reach sexual maturity between 5 and 10 years old, at which point they migrate downstream to the ocean, where they head to the Sargasso Sea to breed. The juveniles then hatch and use the gulf stream to travel back to Europe where they enter our river and streams.